Conceived by Peter the Great as a "Window to the West," and christened "The Cradle of the Great October Socialist Revolution," St. Petersburg is the perfect setting to explore the intriguing complexities of Russia's past and present. 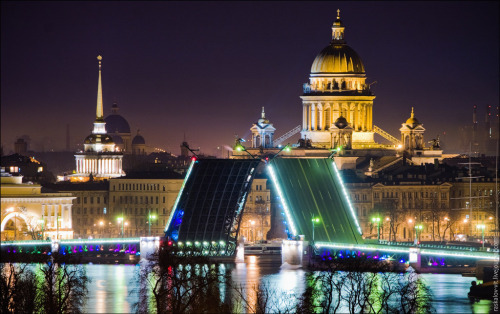 Whether you're beginning or continuing your study of the Russian language, studying abroad in St. Petersburg will help you develop your skills while gaining a greater appreciation of Russian politics, history, and culture. And with homestays, peer tutors, volunteering, excursions, and specialized cultural events, study abroad in Russia offers you unparalleled insight into the city, county, and people, and an a truly immersive international experience. However, you could also choose a different city to study in Russia. Moscow for example the capital. According to the 2013 issue of Forbes magazine, Moscow has the largest number of billionaire residents in the world. Moscow is the northernmost megacity on Earth. It is bigger and richer than London, Paris or Berlin. Moscow is one of the main financial centers of the Russian Federation and CIS countries and is well known for its business schools and science centers. However, studying in Moscow is expensive than St. Petersburg or other Russian cities. It's the price you pay in being at the commercial and power center of Russia. CFER offers you an opportunity to get education within academic traditions and high modern standards under the guidance of PhD professors and lecturers at any State University located in Russia. Two national bodies in the Russian Federation are responsible for the recognition of foreign certificates and degrees. The Ministry for General and Professional Education handles the recognition of certificates and degrees related to higher education and professional qualifications. The Supreme Certification Committee is responsible for the recognition of doctorates. All recognition and equivalence measures are co-ordinated by the Russian Interagency Council on the Recognition of Higher Education Certificates, Degrees and Periods of Study. Invitation and visa: In case all requirements are fulfilled by the student, CFER addresses University which applies to the Federal Migration Service (FMS) of Russia to launch the invitation process. The FMS issues an invitation letter approximately 6 weeks after the University`s official request. The original invitation letter is required in order to obtain a student visa at the local Russian Embassy. Arrival: After you obtain the visa, you must buy the plane (train) tickets and inform CFER seven days before your arrival date. Please make sure to arrange your itinerary so that you arrive before 15.00 hours weekdays at the International office of the University or Academy CFER has enrolled you.